Every two years, a large number of wine professionals attend Alimentaria, a four-day trade fair in Barcelona. The wine tasting in pairs competition was one of the first, but there is an increasing number of side events held alongside the large fair, many of them open to wine lovers. Outside of Barcelona, there are interesting tastings like Cuvée 3000 showroom, which moves to Madrid for the first time, or a four-day course on the wines of Montilla-Moriles led by experts Paco del Castillo and Juancho Asenjo. 1-30 April. The Empordà region hosts a new edition of Vivid, with a month full of all kinds of wine tourism activities such as a hike among vines in Capmany, tastings and dinners, winery tours, exhibitions and various workshops. Prices vary based on the chosen activities, which are held in numerous villages around Empordà. 3,4, 9 and 10 April. Juancho Asenjo and Paco del Castillo lead a really interesting course to learn about the wines from DO Montilla-Moriles in Lavinia Madrid (Ortega y Gasset, 16). The four-day course includes several tastings and explanations about the history and characteristics of the area, biologically aged wines, mixed and oxidatively aged wines and sweet wines. Time: 18:00 Price: €80 Anyone wanting to put all this knowledge into practice can attend a showroom on April 13 with the chance to taste over 30 wines and talk to their producers (Price: €20 that will be discounted with any purchases). 13-14 April. 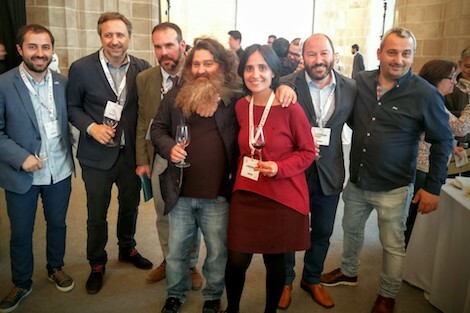 The seventh edition of Vinofest, Navarra's wine festival, takes place in Pamplona with 30 producers based in this DO presenting their wines at the city’s Baluarte Congress Centre. Times: Friday 18:00 - 21:00 and Saturday 11:30-14:30 and 18:00-21:00 Price: €10 (pm) and €5 (am) which includes a free wine glass. Vinofest continues on the weekend starting April 20th at the wineries, with various activities for visitors. 17 April. Garnacha wines are the focus of the events hosted by Terra de Garnatxes association today which include a showroom with producers, mostly from Catalonia and France, followed by a tasting led by Pedro Ballesteros (17:00). From 20:00 to 22:00 the Garnatxa Party will be in full swing. Anyone interested in attending should send an email to info@terradegarnatxes.com for a ticket. Where: Hotel Omm (Roselló, 265) Barcelona. 18 April. Another noticeable event taking place alongisde Alimentaria is Mujeres del Vino, with the presence of more than 25 female winemakers and producers based in different places across Spain such as Anne Cannan from Clos Figueras (Priorat), who has organized the event, Adriana and Beatriz Ochoa from Bodegas Ochoa (Navarra), Ana Gómez from Bodegas Gratias (Manchuela), Bárbara Mesquida Mora (Mallorca), Bibiana García from Cortijo Los Aguilares (Sierras de Málaga), Mireia Pujol-Busquets from Alta Alella, Bárbara Palacios from Barbarot (Rioja) or Pamela Geddes from La Pamela (Jumilla), among many others. Where: Fábrica Moritz (Ronda Sant Antoni, 39-41) Barcelona. When: 19:00-23:30 How much: €5. Send an email to enoturisme@closfigueras.com to book your place. 18-22 April. The DO Montilla-Moriles organizes in Córdoba (Plaza de Colón s/n) its Annual Wine Tasting. This five-day event brings together 27 producers and over 300 wines and vinegars, along with a dozen restaurants from the province. 19-21 April. The cellars of Bodegas Franco-Españolas in Logroño turn into theatre stages to host five microtheatre plays selected at the “+Teatro con Diamante” competition. The public will vote to choose the winning play while visiting the winery and tasting three wines in the Diamante range (white, rosé and Talla de Diamante). Hours: Thursday and Friday from 19:00 to 21:00 every half an hour, and Saturday from 18:30. Price: €17 Call +34 941 251290 to book. 26 April. Fernando Mora will talk about Ageing vs Terroir as he presents his wine classification proposal for Campo de Borja, a region where he works and which was the basis of his final thesis to obtain the Master of Wine title. The talk will be followed by a tasting of wines from Burgundy and Priorat "to understand the different quality steps in a classification". Location: Auditorio de Borja Time: 12:00 Free entrance but limited seats. 27-29 April. The village of Cacabelos (León) hosts the DO Bierzo Wine Fair 2018 with stands managed by 14 producers from the region (Estévez Bodegas y Viñedos, Aurelio Feo Viticultor, Primus Bergidum, Bodegas Estefanía, Bodegas Cuatro Pasos, Bodegas y Viñedos Gancedo S.L., Viñas del Bierzo, Vinos LOF, Don Pedrones, Palacio de Canedo, Vinos Guerra - Vinos del Bierzo S.Coop, Castro Ventosa, Vinos de Arganza, Bernardo Álvarez and Bodegas y Viñedos Bergidenses) as well as tastings and local food.